Nowadays, intelligent electric self-balancing scooter becomes more and more popular among young people. It is frequently-seen that many young boys and girls weave in high streets and bike lanes with small electric scooters. In recent, a horrible scooter explosion happened to Miss Ou, a Hong Kong girl, which caused serious negative effect on intelligent electric scooter sector. After battery ran out, Miss Ou charged it in her house and went to bed. About 4 O'clock, she was awakened by a big bang. She got up immediately and woke up her mum and elder brother. The scooter exploded as they stepped out the house. Unfortunately, all of articles in the house have been destroyed. But fortunately, there was no injury or casualty, because police evacuated more than 200 residents in time. After the scooter explosion happened on Miss Ou, many girls who own electric scooters are so scared that their scooters will explode one day. In fact, the electric scooters made by reliable and reputed manufacturers have no any hidden dangers, and Fosjoas is the best example. Under Fosjoas, there are many different types of electric scooters, because its target consumers are expanded to all people. When it comes to the one that is suitable for girls, Fosjoas V2 twin-wheeled electric scooter must be the best choice. 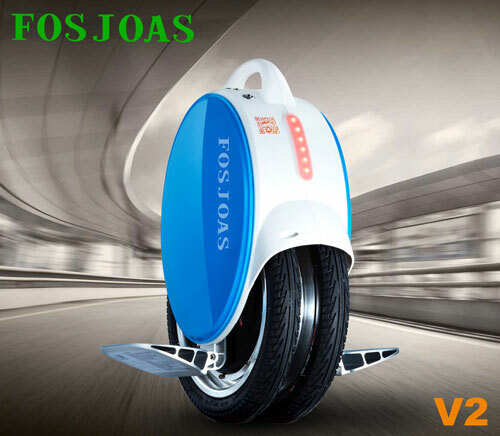 The lovely figure of Fosjoas V2 self-balancing electric unicycle has attracted so many girls. After all, exquisite and fashionable appearance directly influences girls' buying behavior. The cushion pad with two color choices-azure blue and lime green, is full of energy and youth. The two-wheeled design offers much more stable and comfortable riding experience. More importantly, the equipped SONY lithium-ion battery is free from fire and explosion, and it enjoys higher work efficiency and longer useful life than common lead batteries. It can take girls to any place. It can be a transport for work or school. It is also a partner in girls' spare time. All in all, it seems as a bestie that can accompany girls all day long.